John C. Birdlebough senior Alyssa Harley is making a splash with the Fulton varsity swim team this year. On Saturday, the standout athlete from Phoenix was selected as the female swimmer of the meet during 16th annual HAC Swim Invitational held at the Harley School in Rochester. 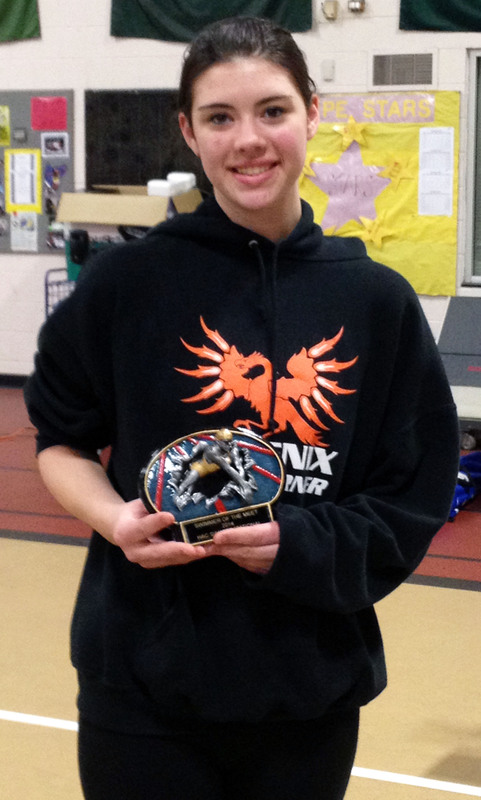 Fulton varsity swim team member Alyssa Harley (of the Phoenix School District) displays the award she won for being the female swimmer of the meet during Saturday’s HAC Swim Invitational in Rochester. As the top seed in the 100-meter freestyle and 100-meter backstroke, Harley dominated both events on her way to first-place finishes. Her times of 1:01.78 (freestyle) and 1:08.78 (backstroke) earned her a spot in the sectional meet in February. According to coach Raina Hinman, despite sitting out her junior season due to an injury, Harley has come back stronger than ever. The Phoenix senior is also a member of a club swim team in Baldwinsville. Thirteen boys’ teams and five girls’ teams from the Section V conference competed in the 22-event meet.